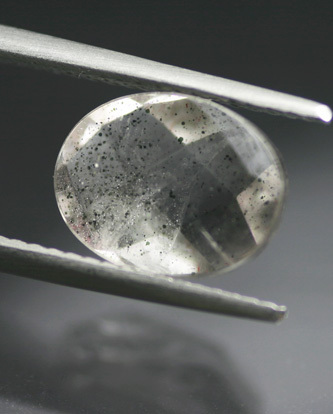 A very fine example of one of the most interesting Quartz inclusion gems found in the last several years. From a very limited find in Brazil comes this Quartz with platelet-type inclusions of the mineral Covellite. 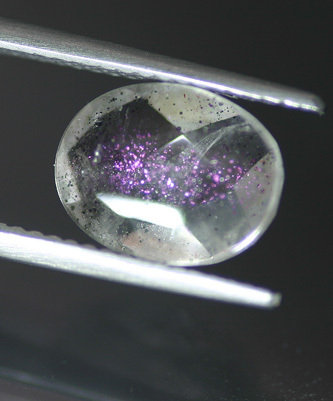 What is truly phenomenal about this particular combination is that while Covellite is metallic in transmitted light, it has a bright pink flash in reflected light - so, as you move the gem a strong pink flash moves across the surface. A very unusual and attractive natural effect. Not surprisingly, gems from this locality have been given the name of 'Pink Fire' Quartz - an apt trade name. This gem is quite well done and shows the effect extremely well - much of the find was nowhere near as nice as this example and even that has now essentially evaporated from the market. The cut is interesting and doubly useful - it is a standard buff top oval from the angle we have shown but the stone could be set in reverse and would make a lovely rose cut oval.